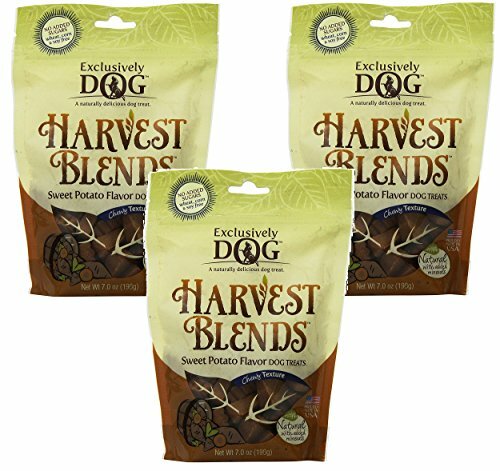 (3 Pack) Exclusively Dog Harvest Blends Sweet Potato Flavored Treats, 7-Ounce Pouches by Exclusively Dog at People For Pets. MPN: 46200. Hurry! Limited time offer. Offer valid only while supplies last. (3 Pack) Exclusively Dog Harvest Blends Sweet Potato Flavored Treats, 7-Ounce Pouches. Pie shaped chewy treats with the great taste of sweet potato. (3 Pack) Exclusively Dog Harvest Blends Sweet Potato Flavored Treats, 7-Ounce Pouches. Pie shaped chewy treats with the great taste of sweet potato. Wheat, Corn and Soy FREE! Chewy Texture. Made with natural ingredients. Free of animal parts and by-products. Wheat, Corn and Soy FREE! Made with natural ingredients - Free of animal parts and by-products. If you have any questions about this product by Exclusively Dog, contact us by completing and submitting the form below. If you are looking for a specif part number, please include it with your message.